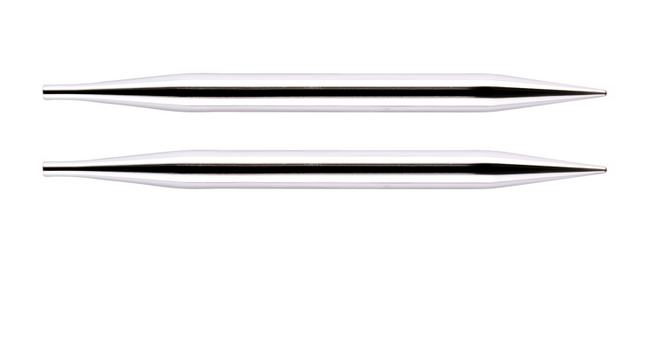 Knitters Pride Nova Platina Interchangeable Needle IC Special Tips are designed to produce circulars in 16" (40cm) length. Each tip measures 4" (10cm) and is to be used with cord of 8" (20cm) length. Engineered from hollow brass pipes and plated with Chrome, its shiny smooth surface is a knitter's delight. The exceptionally smooth and shiny surface enables stitches to move quickly and with no resistance. Light weight insures comfort in the hand and hours of stress free, satisfying knitting. Durability of metal guarantees minimal wear and maximum life. A streamlined manufacturing process makes these needles highly affordable. Innovatively designed and easy to connect cord has a smooth join that enables superior stitch glide and no snagging. Resilient and flexible cords lay flat with no kink or twist – easy to store. Excellent for all levels of knitting experience – beginners, as well. Knitter's Pride Nova Platina – the best & most affordable interchangeable metal needle.